Image of the Short-circuited Quadrifilar helix (S-C QHA). 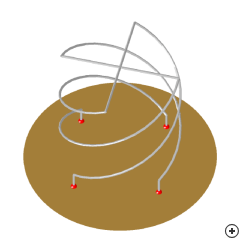 The short-circuit quadrifilar helix antenna (S-C QHA), sometimes referred to as a volute antenna, consists of four helical windings oriented 90° with respect to one another, and ohmically connected at the ends away from the feed point. Typical applications of the antenna include satellite, ground station, GPS, etc. For short S-C QHAs (one turn or less) the radiation pattern is a cardioid. The peak radiation is on-axis, and in this case, in the endfire direction. Traditional excitation of the S-C QHA would cause it to radiate in the backfire direction. Half-power beamwidths of greater than 90° are typical, and good circular polarisation over a very large percentage of the pattern is expected. 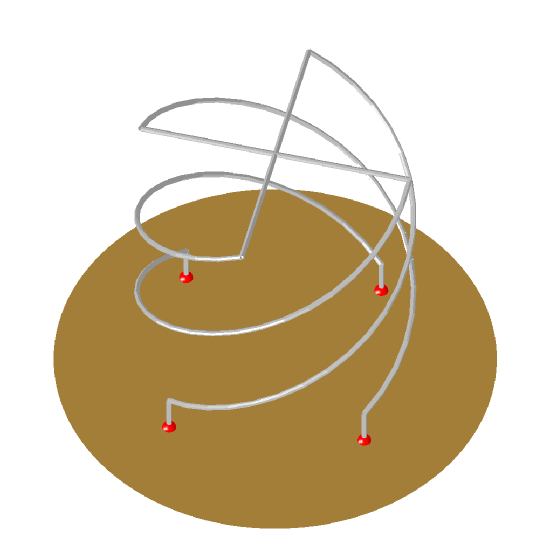 As the number of turns on an S-C QHA is increased, the pattern tends towards conical with the beam peak moving off-axis and an on-axis local minimum. This is a desirable property since in many satellite and ground station applications it is desirable to concentrate the radiated energy into a cone. The optimum beam for such applications is a shaped-conical radiation pattern with maximum gain at the rim of the cone and gain decreasing to a minimum of approximately 10 dB less at the centre of the cone, producing uniform signal strength at the receiver throughout the satellite pass. Axial ratio is lowest around the peak of the conical beam.